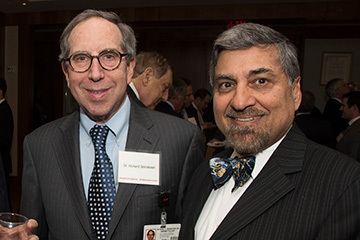 The Center Alumni Council (CAC) was established in 1976 to create a collegial association for healthcare professionals at NewYork-Presbyterian/Weill Cornell Medical Center. Support and promote the educational, research, and clinical missions of the Medical Center. Foster fellowship among current and former faculty and staff members of both the Hospital and the Medical College. Members of the professional staff associated with NewYork-Presbyterian or Weill Cornell Medicine. Inclusion in the CAC community. Invitations to events sponsored or co-sponsored by the CAC, as well as other special events at the Medical Center. Eligibility to apply for CAC-sponsored grants for clinical research, education, and other Medical Center-related projects. Borrowing privileges at the Samuel J. Wood Library/C.V. Starr Biomedical Information Center. Eligibility to join the Griffis Faculty Club. Complimentary subscription to the CAC’s newsletter.